You don’t need to be heading back to campus this month to take advantage of Anker’s back to school sale. All of the products in this post are 20% off this week with promo code ANKERBTS. The USB-C PowerPort wall charger and two-port PowerPort 2 travel charger are both no-brainers, as is the $8 Qi charger if you have a wireless charging phone. Everything in the sale is good though, so grab whatever you need. When these 3/4-sized Arcade1Up arcade cabinets first went on preorder for $299, we thought it was a mistake, since they were supposed to cost $399. At this point though, it seems clear that $299 is in fact what they now cost, but inventory is still limited, since they were out of stock for awhile. Anyway, they’re all back now, and they’re still $299, so if you want one, now’s your chance. News flash: 8TB external drives exist, and you can get one for $160 from Amazon. This is a desktop drive, so it needs to be plugged into the wall to operate, but still, that’s a whole lot of photos, videos, or console games. Netgear’s popular Arlo home security system is a lot like Nest Cam, except the cameras can run off battery power, so you really can stick them anywhere. Today only, a bunch of starter kits and accessories are on sale in Amazon’s Gold Box, including a single camera for an all-time low $100, which is perfect if you want to test drive the system before installing them all around your home. Just in time for back-to-school season, Amazon’s marking down a whole bunch of Crayola art supplies in today’s Gold Box. If you want to earn some PTA brownie points, you can buy some discounted class packs of crayons, markers, modeling clay, or paint brushes to donate to your kid’s classroom, since a lot of teachers end up having to do that out of their own pocket. 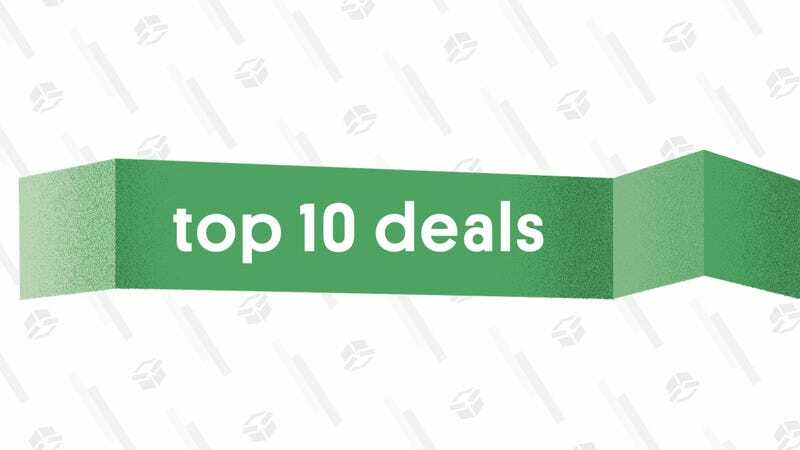 The bulk of the deals though are for individual products, and include the staples mentioned above, plus paint, construction paper, coloring books, higher-end fine tip markers, and more. Just head over to Amazon to see all of the deals. If you already have an Alexa device, Amazon wants you fill your house with even more smart tech with 20% off security cameras, lighting systems, light bulbs, plugs, and more. This sale includes big names in the smart home space, like Ring, Arlo, and TP-Link. Unfortunately, Amazon didn’t make it super easy to redeem the discount on them. You’ll need to make sure the product you add to cart is sold and shipped by Amazon, which means you may need to scroll down to Other Sellers and find the one that says “sold by: Amazon.com” (see example). And, just a reminder, this is exclusive to Amazon users who already have an Alexa tied to their account. Be sure to enter SMARTHOME20 at checkout. BioLife is best known for its wood-burning, phone-charging camp stoves, but its BaseLantern is another great camping accessory, and our readers can save $30 on theirs today with promo code GIZMOPLC. As you might have guessed from the name, BaseLantern is a lantern, and also a base station for other BioLite accessories. With two BioLite SiteLite ports onboard, you can plug in the company’s string lights and hanging lanterns to draft off the BaseLantern’s 7800mAh battery; just drape them over some tree branches for a well-illuminated campsite. With built-in Bluetooth, you can even connect your phone to set a sleep timer on the BaseLantern, control its brightness, or even change the lamp’s color on the fly. And if your phone is running out of juice, you can plug two of them into the BaseLantern’s USB ports for a quick charge. Nintendo’s SNES-themed New 3DS XL doesn’t just look really cool; it also includes a copy of Super Mario Kart, the kart racing game that started it all. It normally sells for $200, but you can get it for just $150 right now, at least until this deal gets red shelled. That’s a match for the deal we saw on Prime Day. If reliability is something you crave in a pair of shoes (if it isn’t, you may need to reconsider), I bet you have Cole Haan in your closet. And if you’re looking for a new pair but don’t want to spend the normal asking price, Cole Haan is having a huge Summer Sale. That means 25-40% off their best sellers, plus 50-70% off sale items. It’s basically their biggest sale of the year. If you need any ideas, we’ve covered the excellent 2.ZERØGRANDs and Laser Wingtip Oxfords on The Inventory, and they’re both included in the sale. Before long, it’ll be too cold to bother schlepping to the gym, but you can keep in shape at home with this cleverly designed PowerBlock dumbbell set. Each dumbbell adjusts from 2.5 to 50 pounds in 2.5 pound increments with just the flick of a selector pin. It’s like a complete weight rack that could almost fit into a shoebox. Today’s $230 deal is one of the best prices we’ve ever seen, so be sure to get this deal before it’s swoled out.